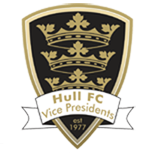 Towards the end of the 2017 season members from the Hull FC Vice Presidents Association visited the clubs training ground on County Road for a sponsors lunch with the first team. At the event all the players signed their shirts before photographs with some of our members along with other player sponsors. The signed shirts were later framed by the club which the VPs plan to auction at a later event to raise more funds.